There is just so much confusion on this topic that as a chemist, I decided to set the record straight. ...or if chemistry is not your thing, skip it. It's easy to see that retinol, retinal and retinoic acid are nearly identical compounds; only the bit on the far right is different (the alcohol, aldehyde and carboxylic acid functional groups, respectively). It's a bit trickier to see that retinyl palmitate is related, partially because the artist didn't explicitly show all the methyl groups (CH3 are implied on the ends of each stick). But also, the single-bond O and double-bond O are reversed, and there is a long hydrocarbon tail (from palmitic acid). Together retinol, retinal, retinoic acid and retinyl palmitate belong to the class of compounds called retinoids. They are also often called preformed vitamin A.
Alpha-carotene, beta-carotene and gamma-carotene all have the same ring on the left as do the retinoids; this ring is called a beta-ionone ring. If you imagine turning beta-carotene upside down, you can see it has a second beta-ionone ring on the right. The equivalent ring on alpha-carotene has the double-bond in the wrong spot and on gamma-carotene is not a ring at all. It's hard to tell because the structure is upside-down compared to the rest, but cryptoxanthin is almost identical to beta-carotene except it has an alcohol functional group on one of the beta-ionone rings. Both the three carotenes and cryptoxanthin belong to the class of chemical compounds known as carotenoids. They are referred to as provitamin A.
Vitamin A is most known for it's effects on vision. Retinal acts as a chromophore within the eye, as such a minor deficiency results in impaired vision, especially in low light conditions, i.e. night blindness. However, long-term deficiency is devastating, leading to permanent corneal changes and possibly resulting in total blindness. Retinoic acid is intimately involved in gene expression as it forms complexes with vitamin D receptors and thyroid hormone receptors, that turn gene transcription on and off. In addition to vitamins A, D and thyroid hormone, omega-3 fatty acids play a role in these processes. Due to both it's genetic effects and because it regulates differentiation, retinoic acid plays a role in maintaining healthy skin. The protective effect on skin and mucous membranes is the first of three ways vitamin A improves immunity. In addition, retinol and retinoic acid are required for the differentiation and maturation of white blood cells, such as lymphocytes. Finally, retinoic acid is required for activation of T-cells. Thus, it's relatively accurate to call vitamin A the anti-infective vitamin since the body's barrier, and both humoral and cell-mediated immunity, all require it. Vitamin A is required both for normal reproductive cycling in females and for sperm production in males. Vitamin A is essential for embryonic development. Retinoic acid works in limb development and formation of the heart, eyes, and ears during fetal development. It is involved in the differentiation of red blood cells and facilitates transfer of iron stores to hemoglobin. It is apparently required for normal lactation. It is important for bone remodeling; normal functioning of osteoblasts and osteoclasts is dependent upon vitamin A.
Retinoids act as fat-soluble antioxidants and studies show they significantly reduce carcinogenesis in skin, breast, liver, colon, prostate and other sites. Vitamin A is utterly necessary to life; deprived animals die shortly after becoming blind. Herbivores have an enzyme (beta-carotene 15,15'-monooxygenase) which can convert alpha-carotene, beta-carotene, gamma-carotene and cryptoxanthin to retinal. Beta-carotene is their primary source of vitamin A because it is the most abundant dietary carotene; it produces two retinal molecules when cleaved. Carnivores do not have this enzyme, so these carotenoids do not function as vitamin A in their bodies. Carnivores must get their vitamin A by eating herbivores who have handily produced vitamin A for them. We are omnivores, and we've attempted to quantify the "amount" of vitamin A the provitamin A compounds represent for us. For many years, vitamin A activity was measured in international units (IU), where one IU = 0.3 microgram retinol. In this system, beta-carotene is about half as effective as vitamin A, and the other provitamin A carotenoids about a quarter as effective. No one but supplement manufacturers uses IU anymore; the unit has been displaced by retinol equivalents (RE). One RE = 1 microgram retinol. Beta-carotene dissolved in oil is half as effective, but beta-carotene in food is only about one-sixth as effective (because it is fat-soluble so not as bioavailable when not dissolved in oil), and the rest (in food) are about one-twelfth as effective as preformed vitamin A. Because new research shows that only about half the provitamin A carotenoids are absorbed at all, another unit has been proposed, the retinol activity equivalent (RAE). 1 REA is still equal to 1 microgram retinol, but it takes twice as much beta-carotene in oil or 12 times as much beta-carotene in food or 24 times as much of the other three to produce retinol equivalent activity. Thus, databases that report vitamin A for fruits and vegetables in IU are vastly overstating the actual vitamin A activity of the food. In summary, as we learn more, we rate the carotenoids as less and less useful in providing vitamin A activity. 80-90% of retinoids are absorbed in the upper small intestine and first enter the lymphatic system and then the circulatory system. Needed vitamin A is extracted from the blood by cells, where it is used. The majority to be stored winds up in the liver, with lesser stores in kidneys, adipose and adrenal glands. Conversion between needed forms of the retinoids requires zinc; thus zinc is critical to vitamin A metabolism. Conversion to retinoic acid is irreversible; thus it is not the best form for dietary intake; retinol, retinal and retinyl palmitate are preferred. Practically, retinyl palmitate is the form most often found in animal foods. The larger problem seems to be absorption of the provitamins in the first place. The provitamins not only don't increase serum levels of vitamin A much, but of themselves! 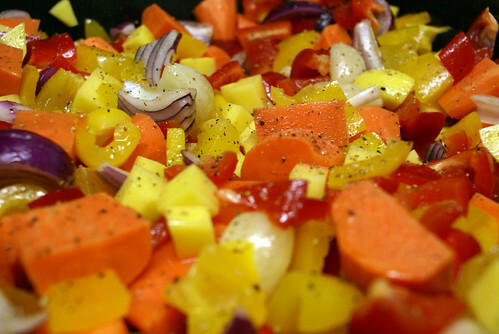 Macerating the food increases absorption, as does cooking and ingesting with fat. Even so, the provitamins are not absorbed nearly as well as vitamin A itself. Those with digestive problems, such as Crohn's, celiac, IBD or having had gastric surgery, are going to have a worse problem absorbing the carotenoids. Pancreatic insufficiency, such as in cystic fibrosis, interferes with fat absorption and thus carotenoid absorption. The conversion of provitamins to vitamin A occurs in the gut, specifically the small intestine. The enzyme that catalyzes the conversion of the provitamins to retinol requires two cofactors: bile salts and iron. Bile salts are produced by the liver and secreted by the gallbladder upon consumption of fat. Thus those who eat a low-fat diet or have liver or gallbladder disease are unlikely to convert well. Additionally, those with low iron stores are unlikely to convert well. It has been observed that hypothyroidism causes high levels of serum carotenes and that thyroid hormone increases conversion, so hypothyroid individuals are unlikely to convert well. There is evidence that obesity lowers conversion from carotenoids to retinoids. Finally, poor conversion is in some cases simply genetic, unrelated to the above causes; the gene has been identified. Thus it seems foolhardy to rely on the carotenoids to provide vitamin A activity. so what are the carotenoids good for? Carotenes such as alpha-carotene, beta-carotene and gamma-carotene are part of the larger group of molecules called carotenoids. Though having no vitamin A activity, lycopene is also a nutritionally useful carotene. Carotenoids that contain oxygen, such as cryptoxanthin, form the subclass known as xanthophylls. Astaxanthin, lutein and zeaxanthin are xanthophylls known to be biologically useful. The carotenoids are pigments, thus the standard dietary advice to eat a wide variety of differently colored fruits and vegetables. In leafy vegetables, chlorophyll produces a green color, obscuring the carotenoid colors. Carotenoids accumulate in the eyes and appear to act as color filters there, preventing light-induced oxidative damage. They slow development of age-related macular degeneration and cataracts. Carotenoids appear to be involved in intracellular communication. In addition, they all are antioxidants, thus potentially useful in amelioration of all inflammatory processes, including cancer, cardiovascular disease, diabetes, immune disorders, neurodegenerative diseases and osteoporosis. Carotenoids have been found to be protective against cognitive decline in aging. Higher dietary intake and serum levels are positively correlated with a significantly lower risk of death. In short, while it is not reasonable to count on carotenoids for vitamin A activity, they accomplish much good for us on their own. A healthy diet should include ample foods that provide both preformed vitamin A and a variety of carotenoids. Since absorption and conversion of provitamin A is often poor, it is important to eat foods that contain preformed vitamin A. Since the carotenoids have nutritional benefit beyond their vitamin A activity, eat from a variety of different colored fruits and vegetables. Lin Y.; Dueker SR.; Burri B.J. ; Neidlinger T.R. ; Clifford A.J. Variability of the conversion of beta-carotene to vitamin A in women measured by using a double-tracer study design. Am J Clin Nutr. 2000 71(6):1545-54; PubMed http://www.ncbi.nlm.nih.gov/PubMed/, PMID=10837297 (accessed July 2012). Hickenbottom S.J. ; Follett J.R.; Lin Y.; Dueker S.R. ; Burri B.J. ; Neidlinger T.R. ; Clifford A.J. Variability in conversion of beta-carotene to vitamin A in men as measured by using a double-tracer study design. Am J Clin Nutr. 2002 75(5):900-7; PubMed http://www.ncbi.nlm.nih.gov/PubMed/, PMID=11976165 (accessed July 2012). Nierenberg D.W.; Dain B.J. ; Mott L.A.; Baron J.A. ; Greenberg E.R. Effects of 4 y of oral supplementation with beta-carotene on serum concentrations of retinol, tocopherol, and five carotenoids. Am J Clin Nutr. 1997 66(2):315-9; PubMed http://www.ncbi.nlm.nih.gov/PubMed/, PMID=9250109 (accessed July 2012). Aktuna D.; Buchinger W.; Langsteger W.; Meister E.; Sternad H.; Lorenz O.; Eber O. Beta-carotene, vitamin A and carrier proteins in thyroid diseases. Acta Med Austriaca. 1993 20(1-2):17-20; PubMed http://www.ncbi.nlm.nih.gov/PubMed/, PMID=8475673 (accessed July 2012). Suharno D.; West C.E. ; Muhilal. ; Karyadi D.; Hautvast J.G. ; Supplementation with vitamin A and iron for nutritional anaemia in pregnant women in West Java, Indonesia. Lancet. 1993 27;342(8883):1325-8; PubMed http://www.ncbi.nlm.nih.gov/PubMed/, PMID=7901636 (accessed July 2012). Lietz G.; Oxley A.; Leung W.; Hesketh J. Single nucleotide polymorphisms upstream from the ß-carotene 15,15'-monoxygenase gene influence provitamin A conversion efficiency in female volunteers. J Nutr. 2012 142(1):161S-5S; PubMed http://www.ncbi.nlm.nih.gov/PubMed/, PMID=22113863 (accessed July 2012). van Lieshout M.; West C.E. ; Muhilal, P.D. ; Wang Y.; Xu X.; van Breemen R.B. ; Creemers A.F. ; Verhoeven M.A. ; Lugtenburg J. Bioefficacy of beta-carotene dissolved in oil studied in children in Indonesia. Am J Clin Nutr. 2001 73(5):949-58; PubMed http://www.ncbi.nlm.nih.gov/PubMed/, PMID=11333850 (accessed July 2012). Riedl J.; Linseisen J.; Hoffmann J.; Wolfram G. Some dietary fibers reduce the absorption of carotenoids in women. J Nutr. 1999 129(12):2170-6; PubMed http://www.ncbi.nlm.nih.gov/PubMed/, PMID=10573545 (accessed July 2012). Castenmiller J.J.; West C.E. ; Linssen J.P.; van het Hof K.H. ; Voragen A.G. The food matrix of spinach is a limiting factor in determining the bioavailability of beta-carotene and to a lesser extent of lutein in humans. J Nutr. 1999 129(2):349-55; PubMed http://www.ncbi.nlm.nih.gov/PubMed/, PMID=10024612 (accessed July 2012). Lengqvist J.; Mata De Urquiza A.; Bergman A.C.; Willson T.M. ; Sjövall J.; Perlmann T.; Griffiths W.J. Polyunsaturated fatty acids including docosahexaenoic and arachidonic acid bind to the retinoid X receptor alpha ligand-binding domain. Mol Cell Proteomics. 2004 3(7):692-703; PubMed http://www.ncbi.nlm.nih.gov/PubMed/, PMID=15073272 (accessed July 2012). Alkhouri R.H.; Hashmi H.; Baker R.D. ; Gelfond D.; Baker S.S. Vitamin and Mineral Status in Patients with Inflammatory Bowel Disease. J Pediatr Gastroenterol Nutr. 2012 July 23 [Epub ahead of print]; PubMed http://www.ncbi.nlm.nih.gov/PubMed/, PMID=22832510 (accessed July 2012). Zago L.B. ; Danguise E.; González Infantino C.A. ; Río M.E. ; Callegari M. Vitamin A and zinc levels in gastroenterological surgical patients: Relation with inflammation and postoperative complications Nutr Hosp. 2011 26(6):1462-8; PubMed http://www.ncbi.nlm.nih.gov/PubMed/, PMID=22411397 (accessed July 2012). Christian P.; West K.P. Jr. Interactions between zinc and vitamin A: an update. Am J Clin Nutr. 1998 68(2 Suppl):435S-441S; PubMed http://www.ncbi.nlm.nih.gov/PubMed/, PMID=9701158 (accessed July 2012). Tang G. Bioconversion of dietary provitamin A carotenoids to vitamin A in humans. Am J Clin Nutr. 2010 91(5):1468S-1473S; PubMed http://www.ncbi.nlm.nih.gov/PubMed/, PMID=20200262 (accessed July 2012). O'Neil C.; Shevill E.; Chang A.B. Vitamin A supplementation for cystic fibrosis. Cochrane Database Syst Rev. 2008 23;(1):CD006751; PubMed http://www.ncbi.nlm.nih.gov/PubMed/, PMID=18254115 (accessed July 2012). Unlu N.Z. ; Bohn T.; Clinton S.K. ; Schwartz S.J. Carotenoid absorption from salad and salsa by humans is enhanced by the addition of avocado or avocado oil. J Nutr. 2005 135(3):431-6; PubMed http://www.ncbi.nlm.nih.gov/PubMed/, PMID=15735074 (accessed July 2012). Clagett-Dame M.; DeLuca H.F.; The role of vitamin A in mammalian reproduction and embryonic development. Annu Rev Nutr. 2002;22:347-81; PubMed http://www.ncbi.nlm.nih.gov/PubMed/, PMID=12055350 (accessed July 2012).